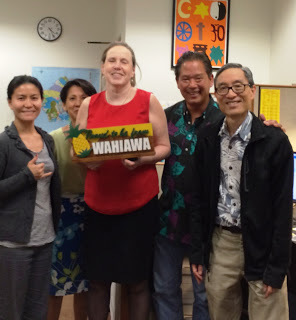 "Choice" Is An Illusion: Hawaii: Thank You Representative Oshiro! This is a belated thank you to Representative Marcus Oshiro, one of the many people instrumental to the defeat of SB 1129, which had sought to legalize assisted suicide and euthanasia in Hawaii. Representative Oshiro took the lead to make stopping the bill one of his main goals for the legislative session. From my viewpoint, he was a major reason we won in what was also a great team effort. Choice is an Illusion got him a plaque in appreciation. Representative Oshiro and many other people worked together to overcome a 22 to 3 defeat on the Senate floor. We won 7-0 to delay the bill in a House Committee, which killed the bill. Thank you again to everyone who made this possible. To learn more about the fight in Hawaii, click here.